Before I go any further, I will say that not having Rafa Sandoval finish this arc does is a big disappointment. I understand that the current nature of DC publishing doesn’t really allow for art consistency and yes I remember that Ethan Van Sciver did draw the second chapter of this arc, but it doesn’t lessen the blow and by no means is this a knock against Brandon Peterson. With the exception of certain face shots towards the end of the comic, It’s not Rafa Sandoval but Peterson does deliver the feel of epic as Hal and Zod clash, above the skies in this planet. Honestly after getting over the initial letdown that Sandoval didn’t draw this issue, Peterson knocks it out of the park. Even though the battle between Hal and Zod was ultimately short, it was pretty refreshing to see Hal knock Zod down. I loved that Vendetti brings up the military aspects of these characters, because after all it their military back rounds that would ultimately define of a huge chunk of who they are. The best battles between heroes and villains bring out their personality to the front along with a good solid construct to the face. It’s not necessary when you’re writing a scene like this but it adds depth to an otherwise thoughtless conflict between to powerful beings. In most cases, having the rug pulled underneath me after Hal arrested Zod would have annoyed me. Twisting with a readers expectations isn’t something that should be done every time but in this scenario it works. Instead of giving readers an ending they’ve seen hundreds of times, the ending that Venditti provides readers sows the seeds for interesting character conflict. One could argue that we’ve seen Hal and John fight before, what makes this internal conflict any different? The difference is the paradigm is different, it make look similar but the minor nuances make it feel fresh. The argument between the two veteran lanterns is a crucial one to their friendship, it’s a textbook example that even the tightest of partnerships will have disagreements. This isn’t a Marvel comic where the characters bicker about something petty for twenty pages with zero resolution. This scene feels like it’ll have some ramification going forward and even if doesn’t it’s still a serves as powerful moment in it’s own right. After getting over the fact that Sandoval didn’t draw this issue, the finale to this arc delivered in almost every way. 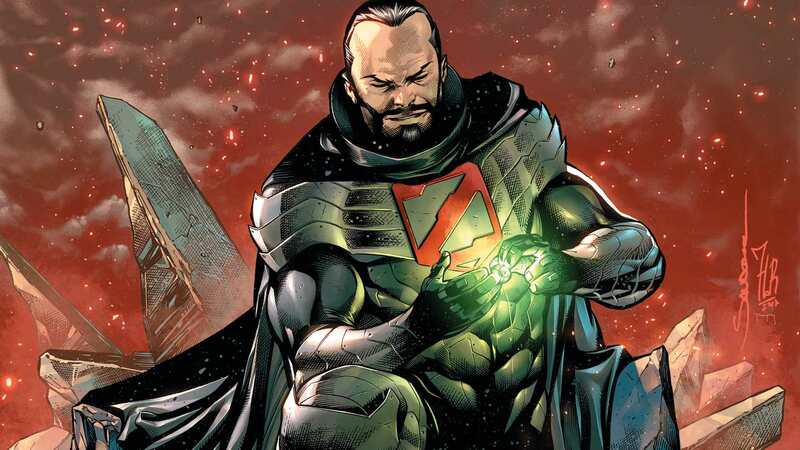 Although I do have to question as to why Ursa and her son didn’t immediately jump into the fray as soon as Hal “arrested” Zod, but that’s a minor nitpick. Brandon Peterson’s art while not perfect, does deliver the bombastic feeling needed when you have a over charged Green Lantern battle against a Kryptonian zealot. While the ending doesn’t have a definitive conclusion, this does leave the door open for another round of Zod vs. The Green Lantern Corps.